I walked past the Orchid Garden when I arrived at the Naples Botanical Garden this week – because I have been spending way too much time there. I wanted to make sure I had the energy to see more of my other favorite spots. After spending two hours wandering, I was on my way to the exit – weary and limping. I decided not to turn into the orchid garden but the pull was too great. I’m glad I did because I found some new blooms, the one above being the most unusual. Does anyone know the name? With hundred of thousands of orchids it takes a long time to identify by going through on-line photos. Thanks to friend Vicki Lorencen who has a wonderful blog for authors of children’s books called Frog on a Dime. She has identified this orchid as Paphiopedilum Michael Koopowitz. I really like it but have no idea of what it could be. Pat, I’m not an orchid expert (or even novice), but I think this is a Paphiopedilum Michael Koopowitz. Wow – what a name! Thanks, Vicky – I’ll look it up. Can’t help with the name but the detail is awesome. It’s beautiful! 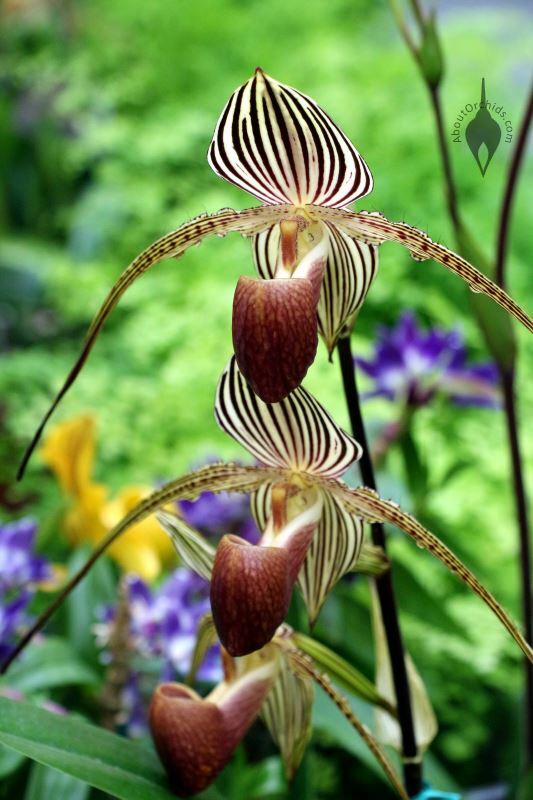 it is a Paphiopedilum, and this one is a beauty! That orchid reminds me of a Geisha bowing.